People living with intellectual and developmental disabilities, mental illness or substance use disorders need special understanding and consideration, especially in tense situations. Thanks to Crisis Intervention Team Training (CIT), law enforcement officers in the Outer Banks and greater Charlotte region, can be better prepared to interact with people if the need arises. In the Outer Banks, the 40-hour program is designed to assist law enforcement officers in responding to incidents involving people with I/DD and substance use issues so they can quickly identify individual needs and handle the situation in the best possible manner. Monarch has participated in this program since December 2016, working alongside other providers, the educational and medical communities, individuals in recovery, families, law enforcement agencies, consumer advocacy organizations and the National Alliance on Mental Illness (NAMI). In Mecklenburg County, officers have toured both the Charlotte Behavioral Health outpatient office and the SECU Youth Crisis Center as part of the program’s 40 hours. Yesenia Mueller, Monarch’s Senior Community Outreach Manager, has presented to more than 100 officers in the region in hopes of improving communication between law enforcement and providers. “CIT is a great way to create a fluid, two-way dialogue and relationship between law enforcement and providers. Many of the officers I’ve presented to weren’t as familiar with the breadth of services we provide, so we’re glad to be able to educate and partner with them to be able to guide people to providers when they need it,” says Mueller. The collaborative nature of the CIT program allows officers a comprehensive look at how to deal more effectively with individuals living with intellectual or developmental disabilities, those recovering from addiction and mental illness, and their families. During sessions at Monarch’s Beach Club in Manteo, participants have been able to interact with people supported to answer questions and complete hands-on activities together. Officers from the Dare County Sheriff’s Department, Manteo Police Department, Kill Devil Hills Police Department and other agencies have attended the training, and the response has been positive, according to Colleen Zoubek, Beach Club Community Engagement Team Leader. Zoubek said an added benefit has been watching some of the people supported at Beach Club learn to relax and communicate easily with the officers when, in the past, they were anxious because of their perceptions of law enforcement. 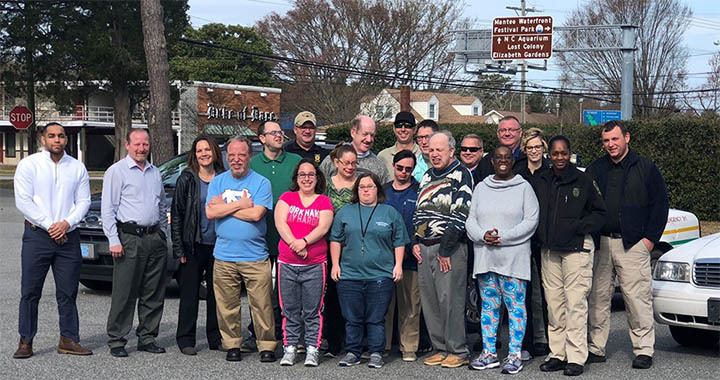 Pictured: People we support from the Beach Club day program pose with local officers following a Crisis Intervention Training in March 2018.